SafeDisc DRM[Note 1] and CD key for installation. The Windows version of this game is not available digitally. 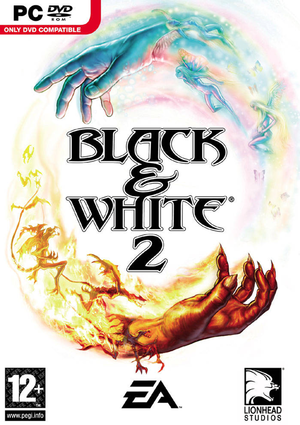 Requires Black & White 2 to be installed. It is advised to install all the patches before playing. Savegames do not carry over the patches. Fixes some serious bugs and crashes. The most notable change is the ability of skipping the tutorial lands, along with more bug and crash fixes. General fixes on modern systems to do with hardware detection limiting graphical options. Unlocks an exclusive creature available after creating a new game. Fixes an issue with the Wolf's mesh. UI elements does not scale with resolution and are ultra small in 4K. Also possible side effects are the HUD getting even more stretched. After doing this use any borderless applications to play with no borders on fullscreen from here. See D3DWindower for further instructions. 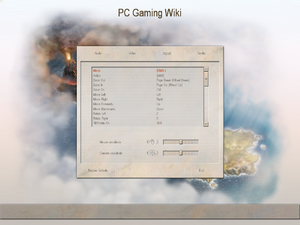 Go to Options, Common and check Use Background Resize. 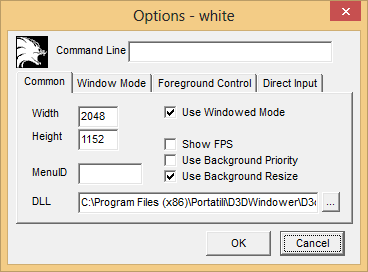 Run it with D3DWindower by pushing the fifth button. Bloom has to be disabled in order for this to properly work. Activating the emulation is not needed. Running the game directly through the launcher will work. Run any borderless applications before running D3Dwindower or else the game will crash. See Helix Mod: Black & White 2. The mouse doesn't respond to slower movements and some tasks, such as building roads, become overly difficult. This will only work on newer Logitech mice and requires Logitech Gaming Software. Click on the mouse at the bottom. Click on Customize pointer settings. This will only work on newer Razer mice and requires Razer Synapse Software. This fix requires Steel Series Engine 3 Software. Open the Steel Series Engine 3 Software. Click on your mouse in the list. Find the Polling Rate section in the lower right of the window. On modern hardware parts of the terrain may disappear. This has been tested to work on Windows 7 (64-bit). Might cause in-game audio to lag or stutter briefly when keys are pressed on the keyboard. Right-click the Black & White 2 shortcut (leads to "white.exe"). Set the shortcut to run in compatibility mode for "Windows 98 / Windows Me". This page was last edited on 2 April 2019, at 05:32.